No, I am not referring to the movie with Mel Gibson. I am referring to women who are in relationships. Especially those who are married and out of the “honeymoon” phase, with children. The other day, my mom posted this picture on Facebook. I get it, we are indecisive 98% of the time. For me, it is usually because I am stuck between do I let myself be selfish or let my husband make a choice (even if it’s not what I would choose)? Men aren’t mind readers. How can they know what we truly want if we don’t tell them? Oh that’s right, because if we tell them, does it really count (in our minds) as them doing something on their own for us? I don’t know much about brain chemistry among the sexes. I do know that they seem to differ greatly (at least from the people I know). Women tend to be more detailed oriented, their minds constantly spinning about the million things to do in a day. For women with children, they are always thinking about improving themselves as a mother, their child’s health and hygiene, and an infinite amount of what ifs. Men, seem to be more of a one track mind. They don’t think (or seem to) a whole lot about details in things. Men with children, how often do you bathe your children, clip their nails, and brush their teeth without being asked to? In my life, I have seen many men lack initiative. I don’t think they do it on purpose, all of the time. We, as married women with children, want our partners to take initiative. Give the children a bath before we get to it. Make sure they brush their teeth and go pee before going to bed. Sometimes, we just would like to be one track minded, knowing that you guys got it! I have always dreamed of hearing the words, “I’ve got it, you go to sleep” when the baby is screaming at 2am. Not only do we want you to take initiative with the kids, but also with us. How many times have we had to tell you something, that we want you to do, only for you to never do it? We don’t want to order you around, but we ask for these things because it is how we feel loved. Remember when we first got together and how you waited on us hand and foot? When you constantly were trying to impress us? Why did that ever stop? We want that back. It doesn’t even have to be everyday, but a little goes a long way. Remind us why you love us, why you married us. Every woman wants to hear her husband talk highly of her. We want to feel loved and appreciated by our partners. If you are a partner that does do these things, especially after 5+ years of marriage and children, then fifty gold stars to you! Yes, this was one sided, but that doesn’t mean men (or partners) should not receive the same amount of affection and initiative from their partners. Being in a relationship means doing these things for each other. You both have to give and take. Balance. Haha! I hear that all of the time, but we really aren’t that difficult. 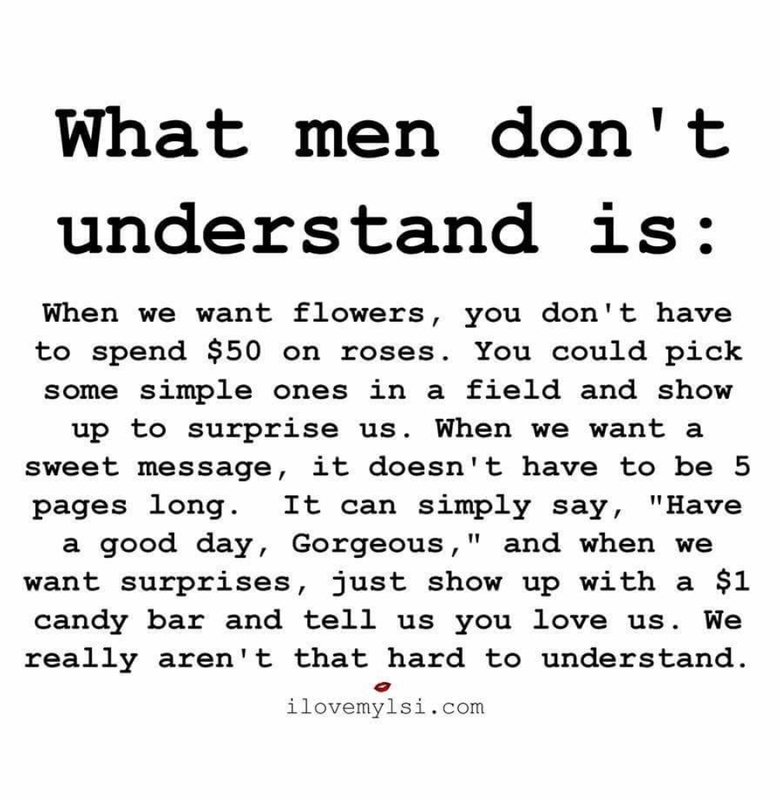 At least, not any worse than understanding men.